This mushroom goes out of its way to be boring. 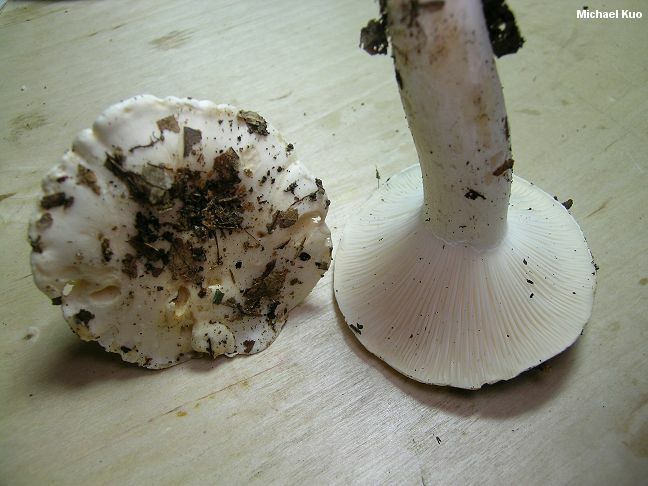 Similar medium-sized, white species of Hygrophorus have slime veils on their stems, or have distinctive odors, or develop shades of brown or pink on their caps with maturity, or have gills that turn pink, yellow, or brown . . . but Hygrophorus sordidus has none of these interesting features. Its cap and gills sometimes turn a dingy yellowish color when very old, but otherwise there is nothing notable about it. And don't get your hopes up for something interesting when you notice the epithet "sordidus"; Charles Peck, the fastidious little man who named the species in 1898, applied the name because the white cap is "usually defiled by adhering dirt." The California version of this species, reported by Arora (1986) and Largent (1985), grows under coast live oak and is more robust than the eastern version; it may be a separate species. Hygrophorus subsordidus is virtually indistinguishable to the naked eye, but appears in pine-oak woods in the Gulf Coast states over winter; its spores are skinnier, measuring 3-4 µ wide. Ecology: Mycorrhizal with oaks; growing gregariously; summer and fall; fairly widely distributed in eastern North America's oak-hickory forests, and reported in California (but see note below). The illustrated and described collections are from Michigan, Illinois, and Indiana. Cap: 5-10 cm; convex when young, becoming broadly convex or nearly flat; slimy; bald; white, sometimes developing a dingy yellowish center with age. 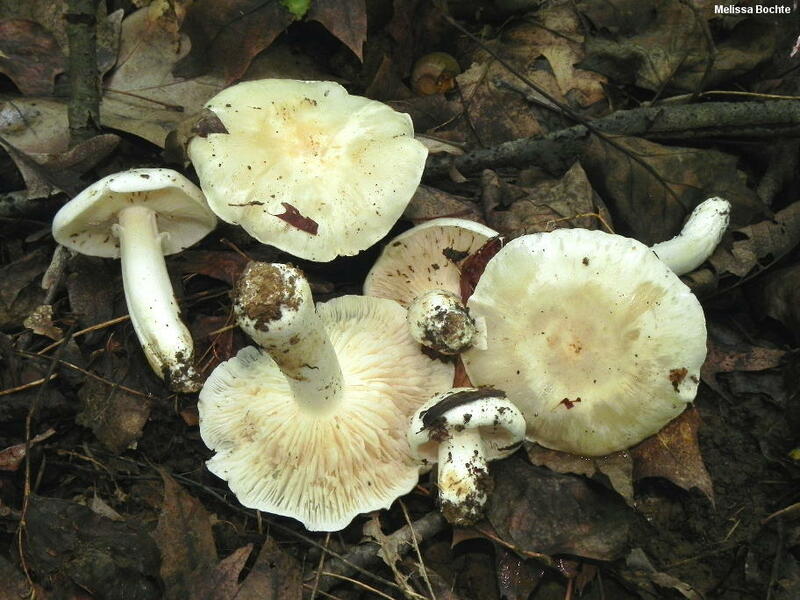 Gills: Attached to the stem or beginning to run down it; nearly distant; white, unchanging or becoming slightly yellowish with age. Stem: 5-8 cm long; up to 2 cm thick; more or less equal above a tapered base; dry; bald, or finely hairy toward the apex; whitish, becoming a little brownish where handled. Microscopic Features: Spores 6-8 x 4-5.5 µ; smooth; ellipsoid; inamyloid. Basidia 4-sterigmate, to 50 µ long. Hymenial cystidia absent. Lamellar trama divergent, with cells 4-8 µ wide. Pileipellis a thick ixocutis with clamp connections present; upper zone of elements brownish in KOH. REFERENCES: Peck, 1898. (Kauffman, 1918; Hesler & Smith, 1963; Smith, Smith & Weber, 1979; Largent, 1985; Arora, 1986; Trudell & Ammirati, 2009; Lodge et al., 2013; Kuo & Methven, 2014.) Herb. Kuo 09120504, 10110901.